The student will learn basic vocabulary necessary to classify sunspots visually. The student will discuss the importance of classification schemes. The student will distinguish between sunspot umbrae and penumbrae. The student will measure the length of sunspots and sunspot groups. The student will compare the size of the Earth to the size of a few sunspot examples. The student will classify sunspots using a modified Zürich classification scheme. Copy and distribute the Student Sunspot Class handout. After students have read through the activity, ask for examples of other classification schemes students have used. Ask students to list some pros and cons to using classification schemes. Define terms at the top of the student handout. Students meaure the sunspots on the handout. Direct students to complete procedure # 1 on the student handout. Note: These sunspots range from simple to very complex! There is a correlation between temperature of the spot and darkness of the image. The darker the portion of an image, the cooler the temperature of that portion of the sunspot. Go over student responses. Have students use the scale provided on each image of procedure # 2 to estimate the size of the sunspot or sunspot group. You may wish to point out to the students that each scale is different. Remind students that they can mark the scales on a separate sheet of paper and then use the scaled paper as a ruler. When students have finished, direct them to draw a circle (to scale) representing the Earth. Go over student responses. Have students look at the Big Bear solar image in item 4 on the student page. Discuss the Modified Zürich Classification Scheme used in this activity, going over both the table of classifications and figure of examples. 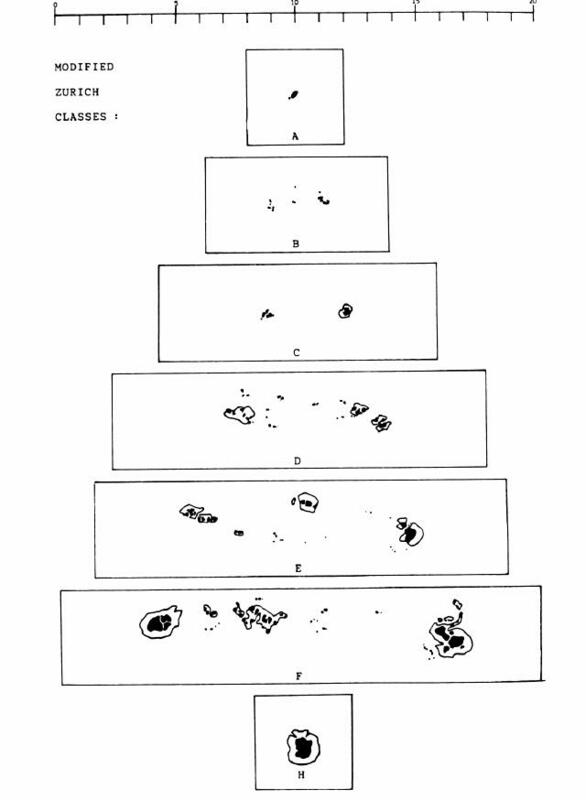 Note: This classification scheme uses visual characteristics of sunspots recorded in white light. It does not take into account the sunspots' magnetic characteristics. Help students compare the Big Bear solar image to the Mees active region map. Have them notice that the longitude and latitude lines get "bunched up" near the edges of the image on the Mees active region map. This is because of foreshortening. The latitude and longitude lines are on a 3 dimensional sphere and are being projected onto a 2 dimensional circle. Help students identify the following sunspots and sunspot groups on the Big Bear image. Direct students to complete procedures # 5 and # 6 on the student handout. Notes: Students may have difficulty in estimating the length of the sunspot groups and may need some extra help. If Internet access is not possible for students, print the sunspot images as handouts. You will also need to post or verbally announce the accepted sunspot classifications after students have completed procedure # 5. *Depending on the resolution of your printer, this may appear to be a single sunspot. Note: Spots can also be categorized as small, medium, and large. A small sunspot would have a length of 2 to 3 degrees. Classifications A and H would be considered small. A medium sunspot's length would be between 3 and 10 degrees. Sunspots with classifications C and D would fall into the medium category. The length of a large sunspot would be over 10o. Sunspots having classifications of D and E would be considered large. Discuss the pros and cons of this particular sunspot classification scheme. Ask students how it might be possible to improve on this scheme. Note: Taking into account the magnetic characteristics of the sunspots is one of the improvements that scientists use today. Classification is an important tool that is used in all of the sciences as well as in our everyday tasks. In this activity students are given the opportunity to practice classifying as well as measuring and inferring. They will also discuss limitations of the classification scheme presented and propose changes to it. Students will learn about sunspots while they practice critical thinking skills.